Low Temperature Condensed State Physics group (Dr. Haruya Okimoto and Assoc. 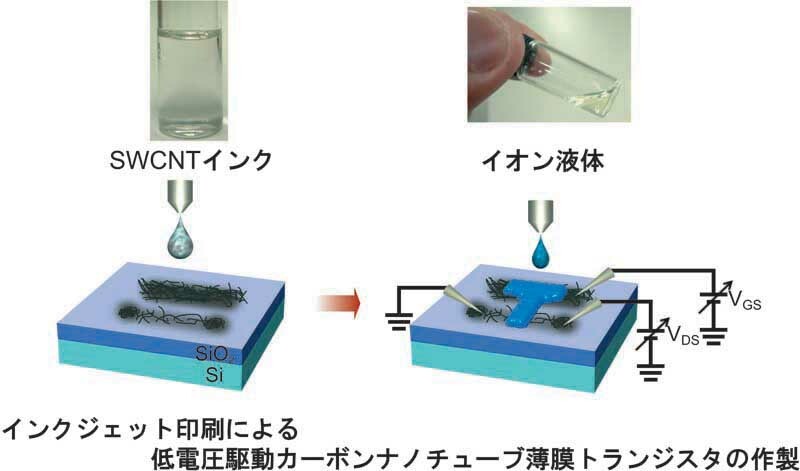 Prof. Taishi Takenobu) has fabricated high-performance single-walled carbon nanotube transistors in collaboration with National Institute of Advanced Industrial Science and Technology (AIST). We also succeeded in applying ionic liquid to ink-jet printed nanotube transistors and operated transistors at very low voltages. This technique accelerates the realization of carbon nanotube novel electronics. This work was performed as a part of the Industrial Technology Research Grant Program in 2006 of the New Energy and Industrial Technology Development Organization (NEDO). The research achievement will be published in "Advanced Materials", and was reported in The Nikkan Kogyo Shimbun (April 8, 2010), The Semiconductor Industry News (March 31, 2010), The Chemical Daily (March 18, 2010), and others.